SEO PowerSuite Review: Helping You Please Search Engines! Alright folks, let us face it: the internet is a really crowded place, and being found in such a crowd can often be a difficult task. Especially for new websites — if you do not have the search engine lords on your side, you will probably end up getting only your family members as your website’s regular visitors. So, if appeasing the search engines is so important, what should one do? Well, most WordPress websites rely on SEO plugins, such as SEO by Yoast or All in One SEO Pack. Of course, having clean code and good content is a pre-requisite, but you do need some third-party help at times. What about going beyond mere plugins? Well, this is precisely what I am going to talk about in this article. Today, we shall be taking a closer look at SEO PowerSuite, an all in one SEO suite to help you get a better search engine rank for your websites. SEO PowerSuite — What is it All About? The suite is a collection of four separate programs (we shall take a look at each of them later on), and it can operate on Windows, Linux and Mac OS X devices. Naturally, it will not make much sense to ditch your SEO plugin (if you have one) in favor of SEO PowerSuite. Instead, we shall be assessing the viability of using this software alongside your existing SEO plugin. Ah… getting a good rank on search engines! Who doesn’t dream of that? Rank Tracker helps you do just that. Rank Tracker automatically keeps an eye on your website’s search engine rank for a given set of keywords. You can schedule the scan yourself, or just carry on with the default settings. Once you set the Tracker to recurring, it will automatically keep looking for your website’s rank across multiple search engines, for various keywords. How does it benefit you? Well, first up, it can easily show you which keywords are doing well for you, and which are not. Secondly, you can also be informed just in case your website improves (or loses) its rank. Thus, while Rank Tracker can help you optimize your website’s search engine rank, it can also show you profit-worthy keywords that you may have overlooked. Rank Tracker claims to support over 342 search engines. It is true, but I will not be happy, though. As far as I know, the only ones that matter are Google, Bing and possibly Yahoo! 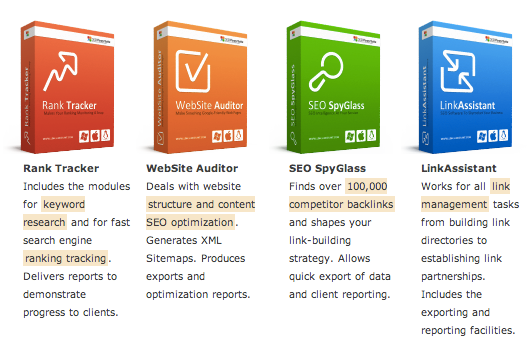 Website Auditor scans your website and informs you of any SEO dead-ends that it may have. In other words, it is like an SEO monitoring tool for your website. Here is what the software can check for: broken links, code errors, duplicate content, server response and 404 errors, missing titles, long titles, poor meta description and pages that may not be indexed. Easy to get info about the culprits, isn’t it? Website Auditor works at two levels: site-level and page-level. In fact, if you are looking to get a bird’s eye view of all the SEO-related issues your site may have, Website Auditor is a really useful software. The name has some adrenaline to it (I read it in Jason Statham’s voice). SEO SpyGlass helps you keep track of the backlinks that your website has earned. But not just backlinks, it also provides you a good deal of details about each linking site. For example, you can get information such as Google Page Rank and Alexa Rank of each backlink. Still need more? Yes, best part is yet to come. How about seeing the anchor text and anchor URLs that your competing website is using? Yeah, SEO SpyGlass is not called a “spy” for no reason, you know! How about the title keyword density of each backlink that your competitor has earned? SEO SpyGlass is a good software when it comes to observing your competition. Obviously, LinkAssistant can serve as your one-stop control panel for catching a glimpse of all the incoming links that your website has. SEO PowerSuite comes in two variants: the Professional version will set you back by $249, whereas the Enterprise version costs $599. There is also a free version available with limited functionality, and you can download it to try it out before you spend money over it. There’s a feature comparison over on the SEO Powersuite website so you can compare the Free and Premium versions. A simple answer would be “yes, you should”, but considering the fact that the software is not free (the free version has way too many limitations to be useful for a regular purpose), it is worth while to ponder over its usefulness. Most of the time, WP users rely on SEO plugins to take care of the SEO front. This works well, to be honest — Yoast SEO and many other plugins have proven to be wonderful performers when it comes to targeting search engines. Naturally, SEO PowerSuite will not be replacing something in the WordPress admin panel. So, question is: can it be used in assonance with the SEO plugins? Basically, the SEO plugins can prove useful in helping you hone or amplify your content in relation to search engines — you know, title tags, meta info, keywords, etc. However, most such plugins fail at telling you things that are often not visible — duplicate content, broken links, page ranks, backlinks, and what not! It is at this junction that SEO PowerSuite comes into play. For a regular user running a medium-sized blog or website, SEO PowerSuite may seem to be an overkill. However, if you look at the amount of traffic that you might gain by discovering newer useful keywords and other related stuff, SEO PowerSuite is well worth the time. Of course, $249 (Pro version) is not everything someone can afford. But if you can, SEO PowerSuite is well worth the investment as well. Yet, what if you cannot? In that case, you can cherry-pick individual components of the PowerSuite (yes, you can opt for separate items if spending $249 for the entire Suite is not your cup of tea). In my opinion, the Website Auditor is the most important tool in the Suite. Most of the time, website owners are good at creating quality content and publishing/posting useful resources and ideas. However, in their bid to offer the best content to their visitors, many website owners overlook aspects such as broken links, missing titles, bad meta descriptions, etc. Website Auditor can serve as your best friend to help you locate such errors on your website and fix them, thereby saving you a lot of time which you can use to create quality articles and publish them on your website! Beyond that, you can also opt for Rank Tracker if you need to take a look at useful keywords that can drive traffic to your website as well as keep an eye on your website’s rank. The other two products, SEO Spy Glass and Link Assistant serve a more refined purpose: monitoring backlinks and incoming links. In my view, if you are managing a big website (say, a magazine with millions of visitors), you already must be having a decent or atleast acceptable system in place to keep track of backlinks and as such, these two products may not be super useful for you. However, if you are just starting out with a website and/or have a medium-sized site, check out Link Assistant and Spy Glass, because an infant or young website does need a good number of incoming links, and these tools can really prove useful for you! What do you think of SEO PowerSuite? Have your say in the comments! 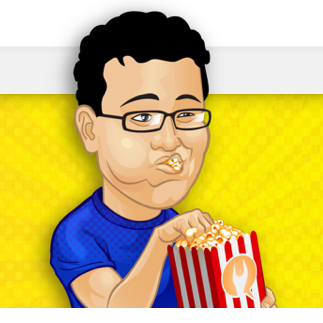 Sufyan bin Uzayr is a freelance writer and Linux programmer based in India. He writes for several print magazines as well as technology blogs, and has also authored a book named Sufism: A Brief History. His primary areas of interest include open source, mobile development, web CMS and vector art. Sufyan is also the Editor of an e-journal named Brave New World. You can visit his website here. This package is one of those which I want for a long time, but because of the price I haven’t bough it yet. I think, Website Auditor is the most useful tool. It is indeed a useful tool, my favourite remains Rank Tracker. I have used this software with some success, but do be aware that as well as the purchase price there is an ongoing subscription charge to keep updated which is not made overly clear when you purchase. For this reason I have stopped using it. Indeed, it’s a kind of yearly license fee that you would pay with other software anyway. The software is great! I’ve been using it for 3 years and saw all the improvements they did during this time. Would like to pay attention to the latest feature – anti-block solution, as it make my “life” (work) much easier, so now I do not need to pay for proxies and anti-captcha services (also saves my money). Moreover it works pretty faster. Look further for new improvements. Indeed a great SEO powersuite post. SEO Powersuite is really a great SEO tools which saves lots of time and efforts. When I used it for the first time, I was just shocked to see that how a tool can provide so much facility and can make link building easy. Glad you love it as much as we do. Indeed a great package! Have been using it for more than two years – very handy to monitor the progress over time and to keep all history in one place. Love the latest updates in Website Auditor and Spy Glass, real functionality boost! Thanks a lot for this review! I have already RankTracker and Website Auditor, and I really love these tools! I’m working now with the keywords analysis and the content optimization, so these apps are all I need for this work. But now I think I need SpyGlass and LinkAssistant too! :D Hope they will have some special offers soon (they had some last winter as I remember).